Why would people put cancer their mouth? What would happen if someone were invited over for dinner and served up some impaired brain growth with a side of thickened digestive tract? Would they stay for a delicious meal or bolt out the door at your first opportunity? What if they were being served a juicy steak with mashed potatoes and corn on the cob, would they stay then? What if those same people were told those two entrée options were actually the same things? These are some of the potential risks of eating produce or meats you know little to nothing about. Take a look into some of the benefits of organic and locally grown foods. 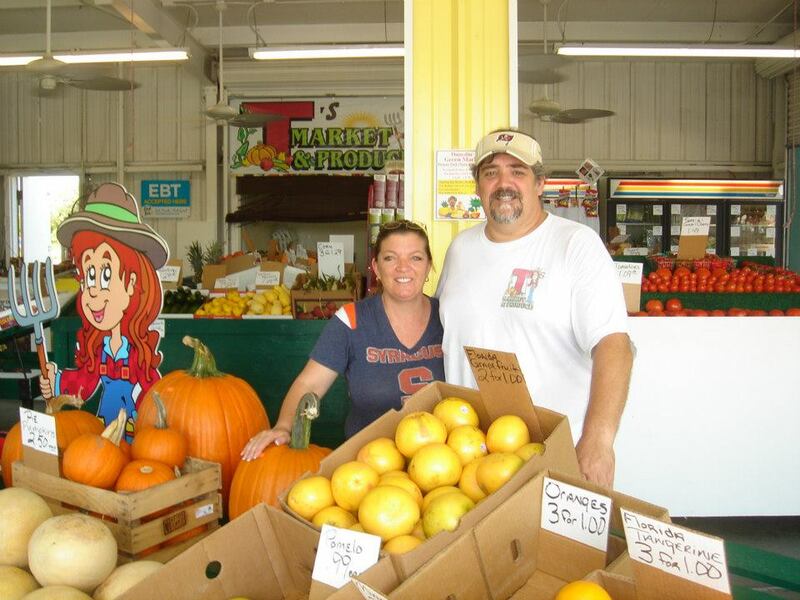 Meet Kenny and Tina of T’s Market and Produce in Palm Harbor, FL. They are two local business owners/philanthropists striving to make people’s dinner a healthier meal. Ken and Tina have their hands in a little bit of everything from produce, to furniture, to plastic sales. They have owned T’s market for the past four years and are pushing to open up towards a much larger crowd. Usually Ken and Tina are found five days a week from 8am to 6pm at their stand on alternate 19 in Palm Harbor. Although they are only there five days a week, the stand itself is open seven days a week. On the weekends you might find Ken, Tina, or one of their sons spreading tasty health foods at local farmers markets in Dunedin, Hyde Park, and Westchase. Kenny and Tina have made a conscious effort to promote the sale of local and organic fruits and vegetables on a daily basis. Most people haven’t done much research on the benefits of eating organic or locally grown food. Although the FDA has approved the use of most pesticides, growth hormones, and genetically altered plants, the debate remains that the testing of these chemicals on animals lead to some disturbing developments in the body, brain, and allergic reaction of these animals. A statement like this is a tip of the hat to the young generation of today. It means younger people are actually becoming more aware of the poisons they may be putting into their bodies. Situational awareness seems to be an up and coming trend that may benefit not only your own body but also the world as a whole. Organic grown produce or meat practices actually creates less air pollution, uses less energy, conserves water, and improves the soil of the ground. Not everything at T’s Market is organically grown, but everything that is able to grow locally is brought to the stand daily. Locally grown produce essentially eliminates the middle-man and gets you the freshest and ripest food from the farm to the dinner plate faster. The average distance a meal takes to get from farm to dinner plate is about 1,500 miles. This transportation uses fossil fuels and creates carbon dioxide in the air from the big trucks that are hauling it. Also the food must be picked when it is premature and then gassed to prolong the ripening process. So thanks to small business owners like Ken and Tina Straub eliminating some of the cancers from out of state foods is happening while most individuals of society are oblivious. Photo is courtesy of T’s Market Facebook page.